Contemporary interpenetrated and increasingly converging ecological, economic, and social crises represent unprecedented challenges and opportunities for the ways in which we interact with the ecosphere. Driven by increases in global population, coupled with rapidly increasing per capita consumption rates, and the consequent contamination and degradation of natural capital, and a disproportionate distribution of the burden on vulnerable communities, our current path is clearly not sustainable. As local governments, civil society organizations and businesses increasingly recognize the need for alternative practices, individuals who can implement trans-disciplinary and integrative approaches are sorely needed to engage with the entirely “wicked” problems of the Anthropocene–the term now widely accepted as describing our current epoch, one in which humans are now the dominant geologic force acting on planetary systems–representing the environmental, economic, and cultural transformations wrought by humans acting on the ecosphere, since at least the start of the industrial revolution. The challenges wrought by this coming of the Anthropocene requires a special breed of practitioners, individuals with a substantial depth in some area of specialization, but also broadly trained in trans-disciplinary methodologies and with the habits of mind grounded in a systems approach, to address the intersection of human activities that are generating sustainability crises at unprecedented scales, and develop solutions that integrate across normally siloed domains of human action. The Sustainability Major takes an approach to Education for Sustainability (EfS) that clearly transcends disciplinary boundaries, while being grounded in a systems approach to an equity-based nested-Triple Bottom Line model. This BA in Sustainability requires thirteen courses (52 credits), including a three course (12 credit) concentration chosen from one of some select disciplines outside of the Major. So, of the thirteen courses, ten courses will be in the field of Sustainability while three courses will draw from foundational courses in a select array of majors across the College (these have been negotiated in advance), which will ground students in foundational knowledge in a disciplinary field of their choice. Of the ten Sustainability courses, eight courses will provide students a grounded understanding of Sustainability as a trans-disciplinary field, drawing on courses from the School of Business, the School of Theoretical and Applied Sciences and the School of Social Science and Human Services. The additional two courses are capstone courses, which will showcase trans-disciplinary engagement with some particular pressing social, ecological and economic issues of our time, at the global, national and local levels. 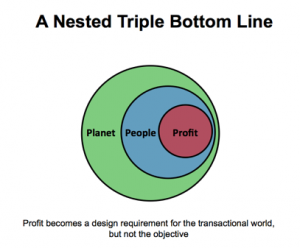 Put differently, a student in this major will take three foundational courses–grounded in the model of the Triple Bottom Line, sometimes called People, Planet and Profit–followed by an integrative Seminar course which will allow students to integrate across the three discrete foundational courses. Then students will take four “immersive” courses, which will introduce them to specific Sustainability skills–Systems Thinking for Sustainability, Policy Perspectives In Sustainability, Methods of Inquiry in Sustainability, and Change Leadership for Sustainability. After completing these eight courses, students will engage with one of a select set of three disciplinary courses outside this Major. Then students will return to the major and complete two capstone courses, the first an Advanced Seminar, in which they will work to integrate across the previously acquired sustainability knowledge and the subsequently gleaned disciplinary content, in some way that helps them zero in on their own individual capstone course, which they will then carry into the ultimate Capstone course, to complete the program. BLS data: Most recent information (from May 2016) indicates that there are 1,023,900 employed nationally in the SOC grouping 13-1199 (Business Operations Specialist). There is no specific data for the sub code .05 (Sustainability Specialist). Vocational Consultants have estimated that there are probably 341,300 jobs in the Energy and Sustainability subgroupings. The projected growth from 2016-2026 in the subgrouping are probably in the neighborhood of 9%. There are an estimated 30,400 employed in this grouping in the Bergen County metropolitan statistical area (known as the New York-Jersey City-White Plains, NY-NJ Metropolitan Division which covers the large geographical area of Bergen, Hudson, Middlesex, Monmouth, Ocean, and Passaic Counties NJ; Bronx, Kings, New York, Orange, Queens, Richmond, Rockland, and Westchester Counties, NY).